Well Maintained Cabin Cruiser Comfort and economy sold us on this cruiser. We researched long and hard before we bought. We love everything about it especially how spacious both the inside and outside. However, we do suffer from the dreaded ailment " 10 footitis", it is now time for us to upgrade. Enjoy the comfort and stability of this wide 11'6" beam that provides a generous amount of living space while providing the economy of the "by the foot fees" of a LOA 32'. The notched, duo-delta conic running surface enhances on-plane performance and fuel economy from twin Volvo Penta 5.7 GI DP sterndrives. These engines were designed to be easy to maintain. An extended swim platform makes boarding an ease. Two transom boxes hold dock lines, fenders, cables, hoses, along with hot and cold transom shower. The spacious cockpit features convertible seating, plenty of hidden storage space and wet bar. The cabin space is generous and provides most of the comforts of home. A flat screen TV and Clarion CD Stereo with 6 disc CD changer and Sirius Satellite Radio enhance your entertainment on the water. The helm is host to the GPS, depth sounder, VHF Radio, and the dual control for the Stereo. Other options include AC with reverse Heat, a 5.0 kw 110v Kohler generator, a single 30 amp power cord, fully enclosed camper top (new isinglass this year) and a full cockpit cover as well, electric anchor, and remotely controlled spotlight. Will provide an electronic copy of our March 2015 marine survey upon request. 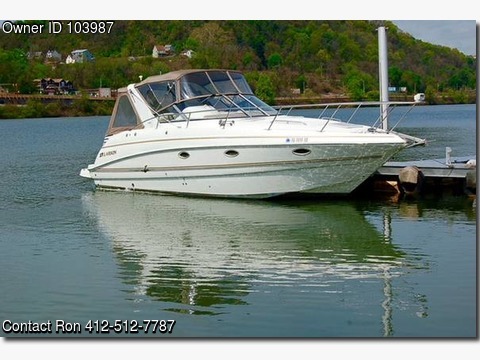 If you are looking for this size boat... you are going to love this very clean and well appointed 2004 32' Larson 330 Cabrio.